A monumental, revealing narrative history about the legendary group of artists at the forefront of West Coast hip-hop: Eazy-E, Dr. Dre, Ice Cube, Snoop Dogg, and Tupac Shakur. Amid rising gang violence, the crack epidemic, and police brutality, a group of unlikely voices cut through the chaos of late 1980s Los Angeles: N.W.A. Led by a drug dealer, a glammed-up producer, and a high school kid, N.W.A gave voice to disenfranchised African Americans across the country. And they quickly redefined pop culture across the world. Their names remain as popular as ever--Eazy-E, Dr. Dre, and Ice Cube. Dre soon joined forces with Suge Knight to create the combustible Death Row Records, which in turn transformed Snoop Dogg and Tupac Shakur into superstars. Ben Westhoff explores how this group of artists shifted the balance of hip-hop from New York to Los Angeles. He shows how N.W.A. 's shocking success lead to rivalries between members, record labels, and eventually a war between East Coast and West Coast factions. In the process, hip-hop burst into mainstream America at a time of immense social change, and became the most dominant musical movement of the last thirty years. At gangsta rap's peak, two of its biggest names--Tupac and Biggie Smalls--were murdered, leaving the surviving artists to forge peace before the genre annihilated itself. Featuring extensive investigative reporting, interviews with the principal players, and dozens of never-before-told stories, Original Gangstas is a groundbreaking addition to the history of popular music. Ben Westhoff is an award-winning journalist whose work has appeared in The Guardian, Rolling Stone, Vice, Pitchfork, and The Wall Street Journal. He spent three years as the Music Editor at L.A. Weekly, and is the author of Dirty South: Outkast, Lil Wayne, Soulja Boy, and the Southern Rappers Who Reinvented Hip-Hop (Chicago Review Press), which Rolling Stone called "packed with lively reporting and colorful social history." 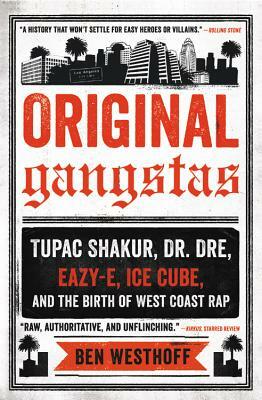 "Original Gangstas is as real as it gets if you want to know the so-called 'gangsta rap' scene. Ben Westhoff refrains from using rumors and innuendos, and instead reports the facts, and he tells all sides of this music movement. The book goes into depth about many stories I'd only previously heard via the streets. As the first DJ to play almost everyone mentioned in the book, I found Original Gangstas compelling reading. Thank you, Ben Westhoff, for this great book! "—Greg Mack, "The Godfather of Hip Hop Radio," former KDAY DJ, current host of the nationally syndicated "The Greg Mack Show"